The topic of environment and conservation is so huge; it’s difficult to know where to start! So I think the best place to start is focussing on the current projects that Animal Works support, and go into the background, perhaps, of why those projects need support or even exist. How and why did those animals end up in those situations in the first place? There is generally more than one reason, and in fact is usually as a result of a number of reasons that become increasingly complex, with no simple solutions. Currently, Animal Works supports the Orang-utan Legacy Forest in Borneo. Orang-utans literally means “person of the forest” (translated from Malay and Indonesian words). There are two exclusively Asian species of Great Apes, native to Indonesia and Malaysia, and are only found in the rainforests of Borneo and Sumatra. They have 97% of DNA in common with humans and, charmingly, their scientific name is “Pongo”. Sadly, extinction in the wild is likely in the next 10 years for Sumatran Orang-utans (Pongo abelii), to followed closely by the Bornean Orang-utans (Pongo pygmaeus). According to the International Union for the Conservation of Nature and Natural Resources (IUCN) Red List of Threatened Species, Sumatran Orang-utans are rarer, and listed as Critically Endangered. It is considered one of "The World's 25 Most Endangered Primates." Bornean Orang-utans are listed as Endangered. 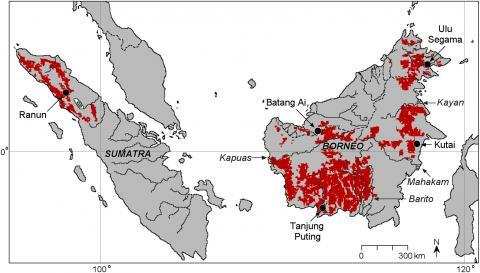 Orang-utan distribution throughout Sumatra and Borneo. 1999. (http://primatologie.revues.org/docannexe/image/219/img-1-small480.jpg ) Probably far less now but was unable to find a more up to date map. For those who don’t know, the island of Borneo is divided among 3 countries: Indonesia (73%), Malaysia (Sabah and Sarawak = 26%), and Brunei (1%) and is 140 million years old, and is one of the oldest rainforests in the world. It harbours 3,000 species of trees; 15,000 species of flowering plants; 221 species of known terrestrial mammals; 420 known species of birds; and around 440 different species of freshwater fish. Quite clearly, Bornean rainforests are one of the most biodiversity rich in the world, and is one of the few remaining habitats for the endangered Bornean Orang-utan, and other native species such as the Asian Elephant, the highly endangered Sumatran Rhinoceros, the recently discovered Bornean Clouded Leopard, the rare Hose’s Civet, and Dayak Fruit Bat. Sumatra, an Indonesian island, also has the most biologically diverse rainforests in the world, supporting a huge array of animal and plant species, but has sadly lost almost 70% of its rainforest in the last 35 years. Many species who reside in these forests are also critically endangered, such as the Sumatran Elephant, whose status was changed from “Endangered” to Critically Endangered” in 2012 because half of its population was lost in one generation. This decline was due to habitat loss and human-elephant conflict. Other species that reside in the vanishing Sumatran rainforests are the Sumatran Ground Cuckoo (critically endangered); the Sumatran Tiger (critically endangered with less than 400 left in the wild); and the Sumatran Orangutan. Deforestation is a key factor in the loss of habitat, and from deforestation comes a swathe of other problems: poaching (much easier access to the animals); human-wildlife conflict (as the animals have nowhere to go, and end up ‘encroaching’ on where the humans have set up camp – which was originally the animals’ territory anyway…and the people wonder why the animals come…); corruption; illegal logging; and the illegal wildlife trade. Even designated conservation areas have not been spared from this destruction. So why is the deforestation occurring? Mainly due to overpopulation (more and more human settlements creep further and further into rainforest); agriculture (rice and coffee plantations often by illegal settlers); plantations (the insidious palm oil industry, pulp, paper, and plywood); and illegal timber harvesting. My husband and I enjoy travelling to south east Asia for our mini breaks, and although we enjoy our time away, we loathe flying over Singapore and Malaysia because we simply cannot bear to see the huge swathes of old-growth (or primary) rainforest being completely and utterly decimated to be replaced by agriculture. We have holidayed in Langkawi where we cannot see the surrounding islands for a week, because of the heavy smoke coming from Indonesia burning down their forests. I can’t even imagine how many thousands of acres were burned to create that much smoke to travel that far across an ocean. We experienced the same heavy smoke when we visited Kuala Lumpur. It was utterly depressing, and all we could do was sit there and imagine how many animals were dying in the process and we actually found it difficult to enjoy our holidays. We asked a number of locals about it and they all said basically the same thing – it happens very frequently. It’s very common. It happens all the time. It’s normal. How can destroying hundreds of thousands, perhaps millions, of acres of old growth rainforest that contain such rich and necessary biodiversity for the survival of humankind (not to mention, animalkind), be considered ‘normal’ and dismissed with a wave of the hand and a disposable mouth cover? Do people not understand not only the importance of trees and plants in terms of their own survival (er, by producing oxygen) let alone the incredibly number of priceless species that are being destroyed every day, never to return? Having said that, the sheer amount of smoke emanating from the burning forests of Indonesia is creating tensions with the neighbouring countries of Singapore and Malaysia, but what can they do? Probably nothing. With good old fashioned ‘sovereignty’, a state has the full right and power to govern itself without any interference from outside states, sources or bodies. And Indonesia is using that to its fullest advantage. And not just with the destruction of rainforests. That’s another blog topic but we’ll stick with conservation for the time being. But sovereignty raises the issue of environmental security and the fact that nature knows no borders. Nature is transnational. 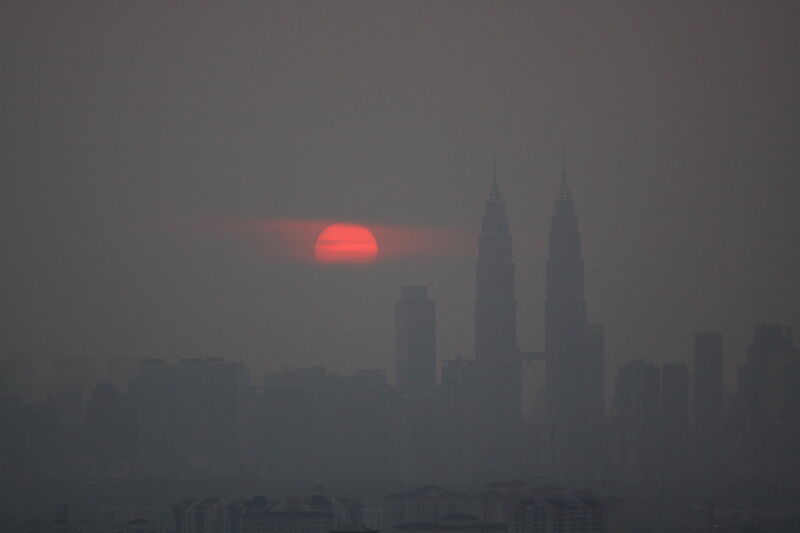 Nature doesn’t care that the Indonesian smoke blows onto Malaysia and Singapore (how annoying!). It raises questions on how states can – or if they are even willing to - work together for the sake of the planet. The bigger picture is oft overlooked and in the meantime virgin rainforests are being destroyed along with hundreds of known animal species, and who knows how many unknown species? Biologists, ecologists and numerous other scientists have been more than vocal in sharing their knowledge with governments about what we as a species are doing to the planet we inhabit. And I know the Australian government is just as guilty. Governments and big corporations won’t listen. Poachers, illegal traders and people trying to put food on the table won’t listen. The general public need to know what is happening, and apply pressure to governments to make policy changes. Basically, all this death and destruction is all to make a dollar. But at what cost? My following blogs will go into more detail on habitat loss – who, what, why, how, when. And furthermore – can it be stopped? ^ Mittermeier, R.A.; Wallis, J.; Rylands, A.B. ; Ganzhorn, J.U. ; Oates, J.F. ; Supriatna, E.A. ; Palacios, E.; Heymann, E.W. ; Kierulff, M.C.M., eds. (2009). "Primates in Peril: The World's 25 Most Endangered Primates 2008–2010" (PDF). Illustrated by S.D. Nash. Arlington, VA.: IUCN/SSC Primate Specialist Group (PSG), International Primatological Society (IPS), and Conservation International (CI). pp. 1–92. ISBN 978-1-934151-34-1. MacKinnon, K et al. (1998). The Ecology of Kalimantan. London: Oxford University Press.